A Fanedit in two parts. 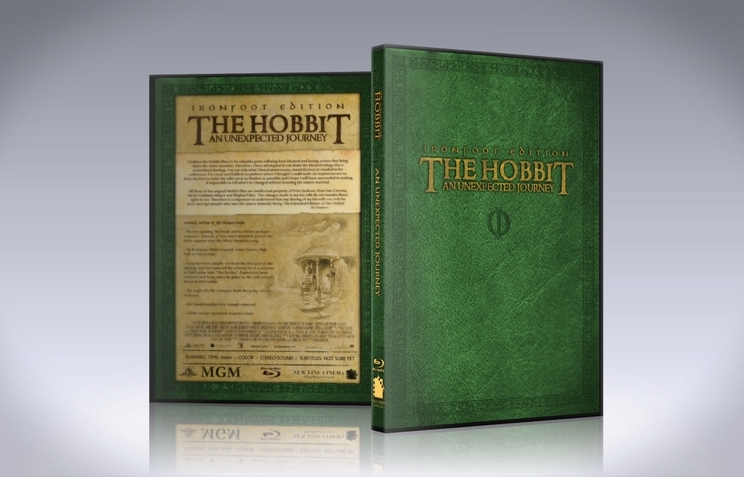 The 'Extended Editions' of the first two Hobbit movies, combined into one streamlined fanedit, forming Part 1 of the "Ironfoot Edition". My attempt has been to cut down The Hobbit films from three to two films with an eye to good solid storytelling. I believe these films to be valuable gems suffering from bloated and boring scenes that bring down the entire narrative. I’ve cut only what I found unnecessary, unsatisfactory or needed to for coherence. My source material were the Extended Editions (with 5.1 surround sound to isolate dialogue or sound effects wherever needed) and the Official OST. I have some experience with editing and I’ve done my best to make my edits seem as flawless as possible and I hope I will have succeeded in making it impossible to tell what I’ve changed without knowing the source material. ‐ Shorter opening: No prologue, no Frodo. However, some of those shots were used elsewhere, such as over the Misty Mountain song. ‐ No Radagast, White Council, Stone‐Giants, High Fells or Dol Guldur. ‐ Azog has been visually cut from the first part of the duology and I've replaced the references to a sorcerer in Dol Goldur with Azog. Sauron has been removed and Azog takes his place as the (still unseen) threat in Dol Guldur. ‐ The eagles fly the company from the wargs straight to Beorn. ‐ Kili‐Tauriel‐Legolas love triangle removed. ‐ I’ve kept the cartoonish action scenes (Goblin escape and Barrel sequence), because although they take away any sense of real danger, I believe they are rather fun and creatively done. ‐ Composited a new shot to make for a real ending. ‐ Flashback, Prologue, Frodo and most of the “Hey, remember Lord of the Rings?”‐moments removed. Instead, Bilbo (though still addressing Frodo) jumps straight into his own story. Everything that’s important will be repeated and I want to get to the dwarves as soon as possible. ‐ When Bilbo opens his book, the drawing of his younger self has been digitally removed (not perfectly yet) so he seems to open it solely for writing in it. ‐ Use of the “Old Friends”‐song to accompany the beginning. ‐ Use of sounds from sound libraries and FotR (ink dipping) to compensate for the ones that got lost while drowned in music. ‐ The drinking‐burping part has been skipped. ‐ After Balin says “It appears we have lost our burglar.” I’ve reversed a shot of Thorin looking at Bilbo and everything after that has been cut. ‐ Some footage of opening flashback (slightly de‐saturated) has been put in over and after the Misty Mountain song (when the theme is reiterated by violins). Violin music from Taylor Davis was used for this, with permission. Inspired by the There and Back Again‐cut. ‐ When they leave the shire we go straight to the farmstead where we will meet the trolls. The first night (including the Azog & Thorin backstory and the orc spying on them), the conversation in the rain about wizards and Radagast’s first introduction have been cut. ‐ When Thorin mentions being betrayed by the elves, we see that part of the flashback (slightly desaturated). Imitated from There and Back Again‐cut. ‐ One frame has been cut from Ori throwing his slingshot to logs being dropped, making it feel more fluent. ‐ Talk of parasites and the ridiculous “We don’t have parasites” ‐ “Yes we do!” part has been skipped. ‐ Used the shot with the waterfall (from whey they leave Rivendell) to make a smoother transition into the hidden valley. Because the sound of the waterfall was drowned in music, I used a different waterfall‐sound as background noise. ‐ Used the Hidden Valley‐song to bridge the gap. ‐ Trimmed Thorin's worry about the elves. ‐ After Elrond arrives and greets Gandalf, we cut straight to them having dinner. (Removed a subtitle that’s fading in). ‐ Put the dwarves eating in front of Elrond asking about the blades. ‐ Cut out Thorin’s refusal to share the map with Elrond. Instead that scene begins with Elrond inspecting the map (imitated from Kerr’s Arkenstone Edition). ‐ White Council cut entirely. ‐ After Elrond says Gandalf is not the only guardian of middle earth, we cut to Gandalf’s conversation with Galadriel about supporting Thorin and Bilbo giving him courage. Galadriel is deprived a more obvious entrance, but I hope Elrond’s lead in will suffice to explain her presence. ‐ Gandalf talking about Bilbo gave me the opportunity to make a match‐cut to him looking at the Rivendell he’s leaving behind. This scene goes over into them walking, rather than cutting to the Gandalf‐Galadriel scene that now comes before it. ‐ The walking shot with the waterfall‐shot was cut (as mentioned previously). ‐ Stone Giants removed. 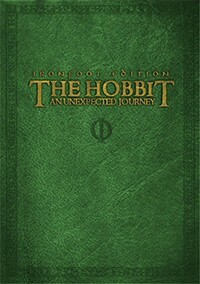 As soon as Bilbo loses his footing, we skip to the part afterwards, where Bilbo falls. (Imitated from The Arkenstone Edition, though I placed Thorin’s “We need to find shelter!” a bit later). ‐ Cut another one of Azog’s “I’m coming after you.” shots. ‐ To make the transition to them sleeping more smoothly, I used a lightning sound and made it sound like it’s coming from outside the cave they rest in instead. ‐ Shortened the dwarves fall to make it less ridiculous. ‐ Cut out The Goblin King’s talk of Azog. ‐ Kept every single frame of Gollum. ‐ Digitally removed Azog from the first shot of the wargs. Not entirely flawlessly, but easy to miss. ‐ Imitated and even lifted parts from the There and Back Again‐cut to remove Azog and let it be suggested via voice‐over that the eagles dropped them at Beorn’s home. However, I made Gandalf dialogue sound more from afar to match better with the eagle‐shots and I’ve also made color‐correction some of them to make it night, which made for a cleaner transition. ‐ Used the Extended Edition scene with Beorn where they each come out in pairs. ‐ After Beorn pours some milk, we skip ahead to avoid the Azog‐dialogue. ‐ I’ve kept Beorn’s lines about these lands crawling with orcs to foreshadow the climax‐attack during the battle sequence. ‐ Used the Extended Edition scene where Beorn talks about orcs gathering in Dol Guldur, but replaced “the sorcerer” with “The Defiler”. I’ve used the word from where it has elsewhere been cut while still matching the tone of voice. This worked much better than anticipated as you never see their lips anyway. This has been done a few times in Part II as well. ‐ I generally trimmed the EE‐conversation between Beorn and Gandalf down to remove all references to the orcs chasing them (that aren’t anymore) as well as specific references to Sauron or Ringwraiths. Re‐ordered some shots for a smoother transition. ‐ Cut the weird Galadriel telepath‐exposition. ‐ Used the Extended Edition version for Mirkwood, though I’ve cut the white stag, trimmed their walking and color‐corrected the last part to match the blue‐ish hue of the rest of this sequence. ‐ Cut Bilbo seeing himself. ‐ Added a little bit of red into the shots when Bilbo is looking from atop the trees. Somehow that makes the shot more believable for me. ‐ Bilbo losing his ring and killing the baby‐spider removed. ‐ Removed Gloin’s reference to Gimli. I don’t mind him mentioning Gimli, but the Legolas’ over‐the‐top insult to set it up is annoying. ‐ Removed Tauriel saying “more spiders will come”, though kept her heroic interlude as I want to keep her. ‐ Removed the interaction between Tauriel, Kili and Legolas. No weird love‐triangles or trouser‐jokes in this cut! ‐ Added a shot of the Arkenstone when Thranduil talks about it. The shot has been reversed to lift from the king to the jewel. ‐ Removed the talk of Legolas fancying Tauriel, but used her last shot (reversed) when she looks sad to end the scene with. Now it’s because of Thranduil’s refusal to care for the world outside, which was the point of this scene anyway. ‐ I’ve left in the beginning of the exchange between Tauriel and Kili about his runestone. It humanizes both camps to one another, but without any infatuation or sociopathic stares from Legolas. ‐ Removed the worst of the GoPro‐shots. ‐ Removed Gandalf’s visit to the High Fells. ‐ Cut from Balin asking for Bard's boat to allof them sitting on it and Balin counting money. ‐ When they all look at the mountain, I've cut out Bilbo saying "I do believe the worst is behind us" from the original ending in An Unexpected Journey and put him in a different background. It's not a perfect visual effect, but it just might pass if you're not looking for it. ‐ We then go over into the original ending of An Unexpected Journey, but color‐corrected to fit with the misty blue tone of the previou scene. The shots inside have also been lowered in saturation. ‐ Removed Elijah Wood & Christopher Lee and put in Luke Evans & Evangeline Lilly instead. ‐ Put in my own (user)name next to the editor as fan‐editor. The edit description was enough to pull me in for a watch of Part 1, though I like the Kerr, Menbailee, and Rangerkris edits so much that found it somewhat difficult to do so. But I was looking for an intermediate cut for the kids, who complain every time I watch those other edits that have all of the cartoonish scenes removed. --Crack the plates song; I'm mixed on this one and think its a keeper, though it pushes the limits of silliness I can tolerate, like the one dwarf catching plates behind his back without looking. I never had the impression from Tolkien reads that dwarves were masters of dexterity. --The Bilbo faint cut is awkward. I think that should have been left in. It's a further indicator of just how sedentary he has become. --Dumbest scene in the movie is when the dwarves throw down their weapons because the trolls are threatening to pull Bilbo apart. What does that accomplish other than let them all be eaten? Only the Menbailee cut has addressed this - it's an awkward clip but I was willing to deal with it just to have that ridiculousness removed. --It was hard to figure why Elrond's elvish intro to the dwarves was removed. --As W said, wanted cut short of goblin chase and barrel ride. --To me the bear chase should have been left in. It explains why in the later scene he's outside chopping wood and has not and already seen the dwarves. --Echo Mirkwood. More time in there stumbling around is great, a more sinister feel results. --Color change with Bilbo and butterflies outstanding. Scene was much more powerful. --I can't deal with the dragon vs dwarf scene, even edited. Truly my advice is delete it into the void, even in a playful edit such as this one. It's one of the worst creative license decisions in the history of movie adaptations. Have I conveyed my loathing adequately?! --This edit has joined my permanent collection! Nice work! As with all other fan edits, the focus is shifted back to Bilbo, and the quality of the film is improved a thousand times over due to Martin Freeman's fantastic performance. Shrouding Azog in mystery builds up a lot of anticipation for the battle of the five armies, and it's good that all allusions to Sauron are removed. The Lonely Mountain violin tune near the beginning. I genuinely got chills hearing it. The way you handled the wargs sequence was fantastic, it flows incredibly well, and the subjection colour correction you've done for continuity was also amazing. Thank you for including Beorn's intro scene, as well as the extended scenes in Mirkwood. The scenes in the Mirkwood forest were some of my favourite scenes in Jackson's films, and it's so nice to see them get a chance to shine. Tauriel. You handled Tauriel extremely well. We finally get a real indication of a good character, instead of a female character who is bogged down in a cheesy love story. I also really like how there's more of an emphasis on her instead of Legolas. The opening of the film feels a bit awkward due to the different music than in the original. The Goblin Town chase has a few too many silly gags for my liking. I do like the "Cut the ropes!" gag, and the rock rolling down the hill, but Kili deflecting arrows with his sword, the swinging bridge, and the Goblin King's death are just too unrealistic. I spent most of the sequence waiting for you to cut back to Bilbo. Maybe a few extra trims would help make the action sequence feel more realistic and increase the tension. The barrel sequence. I actually like the barrel sequence, I think it's a really awesome action set-piece; but I have the same issues with this sequence as I do with the Goblin Town chase. I would've left the sequence as it is, but cut out Bombur's barrel killing spree and Legolas balancing on Dwarf heads. In closing, this is a solid edit which I found to be very enjoyable, it feels closest to what Jackson initially intended The Hobbit to be.